Mark Webber had toiled hard in England for a couple of years, seeing off the danger period for drivers from Australia daring to further their careers on little more than loose change. As 1997 drew to a close he completed a test in the Mercedes-AMG team’s FIA GT sportscar at Austria’s A1-Ring, doing enough to secure a seat alongside the talented German Bernd Schneider; 12 years Webber’s senior. For the FIA GT Championship in 1998, Webber was paired with Schneider in the CLK-LM while the Mercedes team’s sister car was crewed by another mix of experience and youth in Klaus Ludwig and Ricardo Zonta. Schneider had won the inaugural season of the championship the previous year and as such he and Webber would be highly favoured to succeed. As it was the 10-round championship was dominated by the Mercedes-AMG GT1 machines; each car sharing five wins with the title going to Ludwig and Zonta, who won the final three rounds. For Webber his most significant career win to date came midway through the season in the Suzuka 1000km race where Webber and Schneider dominated. The race was run in extreme heat with the Australian later admitting that it had been the most physically demanding race he had encountered. Mercedes became a victim of its own success in 1999 with the GT1 component of the FIA GT Championship cancelled because no other manufacturer entered a team against the three-pointed star. The focal point then switched to Le Mans in June where Mercedes, with its revised CLR LMP car, would take on the challenge laid down by Toyota with its GT-One prototypes. Webber had appeared serious chance in the lead up to the 24 Hour race, even though Toyota were short-priced favourite to win. However he suffered a serious setback in Thursday qualifying when the CLR flipped going into the Indianapolis corner. 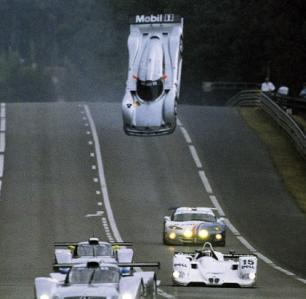 Then in the Saturday warm-up, Webber was again sent into a terrifying aerial flip, this time toward the end of the Mulsanne straight. The car he was booked to share with Jean-Marc Gounon and Marcel Tieman was withdrawn. Initially Mercedes believed the problem was driver related, an erroneous assumption which had unfortunately cast a shadow over Webber. 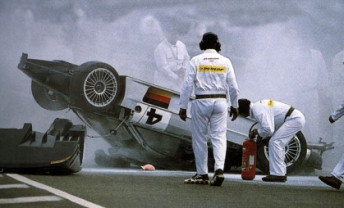 However when Peter Dumbreck, in another of the three factory CLRs, flipped into the forest on the outside of the circuit, Mercedes went into damage control. The team immediately ordered the sole remaining Mercedes piloted by Schneider into the pits and out of the race. Dumbreck’s flip had been caught on TV, unlike the two Webber accidents which were unable to be analysed. Mercedes Motorsport boss Norbert Haug had called a press conference to correct earlier suggestions that Webber had been to blame and that in fact there was an aerodynamic flaw at the front of the car. Alan Webber was ashed-faced when confronted by a small team of Australian media soon after the warm-up smash. Initially at least Webber Sr remained shocked that his son had escaped serious injury for the second time in the space of a few days. He knew that any fallout could have dire consequences for what had been shaping as a promising career. For Webber, questions came into play that he needed to abandon sports cars and shift his focus beat into open-wheel machines. 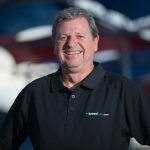 He parted company with Mercedes and then secured a drive under the wing of Aussie expat and European Aviation entrepreneur Paul Stoddart. His efforts there would also earn a role as test driver for the Arrows F1 team, having earlier sampled the team’s car at the end of 1999. 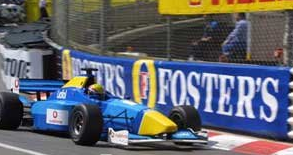 After winning at the second round of the F3000 Championship at Silverstone, Webber went on to finish third and at the end of the year he scored a test with Benetton at Estoril. He made a big impression and was immediately signed as the squad’s F1 test driver for 2001. But his main mission in 2001 was linking with Super Nova for a second successive season in F3000 after doing a deal with his new manager Flavio Briatore. Webber would win three races including Monaco behind the wheel of the Super Nova car but that elusive first championship since moving out of karts all those years ago continued. He finished second at season’s end to the lanky Brit Justin Wilson, who he would eventually meet again in Formula 1. Briatore played a major role in then securing Webber what he had moved to England for in the first place; an F1 drive for 2002. Fans wishing to send their own messages to Mark this week are being encouraged to Tweet using his @aussiegrit account and the #thanksmark hashtag. A selection of Tweets using the tag will be shown to Webber this weekend in Sao Paulo and be read out on Network 10’s Brazilian Grand Prix coverage.